Huntly spent much of its long history under the name of Milton of Strathbogie. 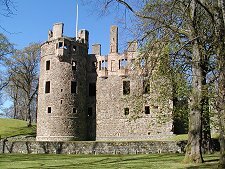 The original name persisted long after 1506, when Alexander, the third Earl of Huntly, was granted a charter changing the name of his castle (subsequently Huntly Castle) and his surrounding lands. The origins of Huntly probably date back to a settlement serving the original castle, the Peel of Strathbogie, built in the 1180s. The major change, however, came in 1769, when the Duke of Gordon established a planned town here. With the new building and new plan came acceptance of a new name, and "Huntly" finally replace Milton of Strathbogie on the maps. By 1799 Huntly had 3,000 inhabitants, compared with around 4000 today. A range of industries operated here, with textiles playing a significant part. Over the following years it also tried its hand at distilling, though with much less success than nearby Speyside. The textile industry had also disappeared by 1850. The real turning point for commerce in Huntly came with the arrival of the railway in 1854. It later became an important freight centre on the Aberdeen to Inverness line, and continues to enjoy services to both cities and beyond. Huntly gained a new railway station in 2000. 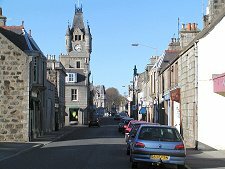 Huntly is also well placed to take advantage of the road network, lying on the main A96 from Aberdeen to Inverness. Most would agree it has been much better placed since the building of a bypass in the 1970s, taking the through traffic round the south of the town. 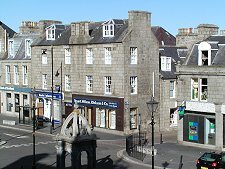 Huntly itself is a solid town build largely of an impressive grey stone. At its heart is the main square. From here the road to the south, and the bypass, passes the imposing clock tower built in 1890. North from here the road runs past the town's war memorial and through an arch in the Simpson Building en route to Huntly Castle. 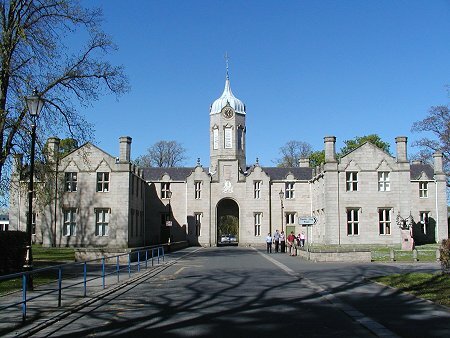 The Simpson Building was built in the late 1700s with stone quarried from the Castle. 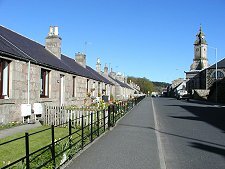 The centre of Huntly is an intriguing and attractive mix of the large stone buildings on the main routes and around the square, backed by a grid of streets flanked by smaller scale stone cottages and houses. 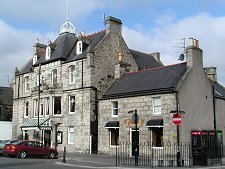 Overlooking the south west corner of Huntly's main square is the Gordon Arms Hotel, which we would heartily recommend for its friendly welcome and service, for its comfortable accommodation, and especially for its food. 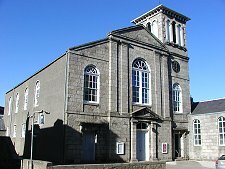 It is something of a surprise to discover that since its unsuccessful foray into distilling in the 1800s Huntly has not shared this part of the heritage of many of the towns and villages to the west and north west of it like Dufftown or Keith, though it does have a brewery. However, Huntly does have much to see and do, including a Nordic Ski Centre near the castle: the UK's only year round centre for the sport. And of course, there is Huntly Castle itself, in the care of Historic Environment Scotland.